It's my birthday tomorrow! Dad and Mum have taken half day leave to bring me out for play. I'm not sure what's in stored for me, but I'm just happy to be spending time with them. Well, the school held an early celebration for me, they sang me birthday song and gave me a beautiful birthday card. Made with love by the teachers and from all my classmates! It wowed mummy... check it out! And photos of all my classmates!!! Thank you for the card and wishes! It's my 2nd trip to the Universal Studio! This round with some rides and shows opened. Mummy's company had 3 exclusive nights with the place, so staff got each tic at $20, inclusive of food voucher. It was a maximum of 2 bookings per staff, but with some help, she got another 2 more tics for jiu jiu and Berry jie jie. Mummy was allowed to leave work 2 hours earlier today, so she could prepare for the trip. Bringing me along involves the usual long preparation of 'to bring along' items. Daddy always say my bag weighs like a dumb bell. Yet when we arrived, Mummy left my dinner in the car. It was a long walk to and fro our car. Blur Mummy! I took a short nap before the Waterworld show begins. After my nap, I felt energised for the rest of the fun. Mummy was surprised that I could watch the shows with much focus, I was really watching them! In fact, we only caught 2 shows - Waterworld and the Shrek in 4D. I didn't wear the special glasses for the 4D show, but I enjoyed it! The loud 'gun shots' at Waterworld didn't startle me too, which Mummy thought I would be clinging onto her when loud sounds were made. We're all exhausted by fun! I had a real late night, got home at midnight, went to bed at 12:30 a.m. And I've school tomorrow, so are Dad and Mum working. You can't believe this, Mum is going to Universal for the 3rd time tomorrow! That's madness! But no choice, it's her department's teambuilding event. I hope she carries no phobia for Universal, because she promises to bring me and great grandparents there for more fun! Out of curiousity, Daddy started me on pencil and paper. He wanted to know which hand will I use to pick the pencil. It's too early to know, but he was just having fun with me. At first, I picked up with my left hand, but subsequently, I used my right. Right Hander? Haha. Yesterday, I had the privilege to be prayed for, by Pastor Kong in church. It was my dedication day! I was sleeping when he came by me. After which I was awoken by the stage's spotlights, I cranked a little before I realised many thousands of people were watching me. We had a bursting fun of celebration yesterday. Many uncles and aunties came for my little birthday party. Thank you Everybody! It was also a long and tiring day for Mum and Dad. Organising it took lots of preparation and research. This is so to ensure that all adults and children enjoy the party to the max! Mum and Dad didn't want a party initially. It actualized only after some thoughts and discussions. After all, it is a significant milestone of my life! 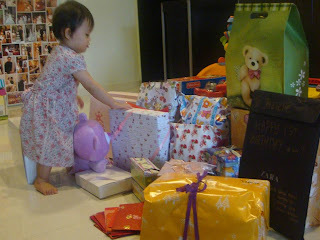 Mummy doesn't want to look back and say,"Aiyah, should have thrown a party for her." Most preparation was therefore quite last minute. And for it being my first year's birthday, there wasn't many choices of party types. What's good enough for a one year old birthday party is just, food, cakes, balloons, chocolates, sweets and people!!! We hope everyone enjoyed the moments as much as we did. It took time and efforts for our friends and relatives to come, and we truly appreciate it! Additional credits to: Uncle bear, Auntie Sha and grandparents for helping with area cleaning. Thank you for your labour effort upon your presence and gifts! My birthday banner and balloon! I love Eeyore... so that sets the theme. The sweetie corner for everyone! My 2 tier cake with 'Pooh and Friends' figurines. Mum had to buy the figurines separately for the baker to decorate on my cake. They don't provide the toys due to copyright issue. In fact, 3D cakes never fail to 'wow'. Many were impressed with my cake! So were we. The time spent at the cake shop, discussing the layout, wasn't in vain. I had an enjoyable day with everyone! Yes, EVERYONE! Venues:If you have a little more budget, you may consider a 'real' birthday party with games, host and entertainment. But for my age, I won't know how to enjoy these yet. Instead, Mummy settled with a simple celebration - A function room booked at grandparents place suited well for this purpose. The location here seemed a little inconvenient. It looked really fun though. It's baking birthday party at Bakerzin. Mummy likes the idea of kids baking. That's probably where they can express their creativity and reveal they more of their characters through the process. She recalled seeing a class of children attending a baking class at Bakerzin, united square. She made a promise to herself then, that she'll bring me there some day. The little kids looked so so so adorable in their little chiefs wear, with the tall white hat! Anyone interested to join me in another 2 years time? Early collection of interest first. Hee. 5. http://www.grassrootsclub.org.sg/restnrelax.html#childrenThis was where we wanted to hold the party initially. We couldn't because the date we wanted was taken. The rental is reasonable and place looks fun. Booking fees is just for the venue, not a party package. It is simple and was to our intention. This forum introduces many places where you can get nice children's cakes. Presentably nice, but unsure of the taste. Bakerzin cakes taste good, so will be the birthday cakes, I guess. 8. http://www.pokkafood.com.sg/gauche/Cakes here taste excellent! We're just not sure if they do beautiful children's cake. Will have to check in store on that. After all the search, we are believers of taste over appearance. Which is why we settled with Pine Garden (http://www.pgcake.com/). One that we're confident and have tried of its taste. Mummy chose a 2 flavoured, 2 tier cake - Orange Zest for children and Lychee Martini for adults. Many said the cake tasted good. That made us, the hosts feels good. Phew! Food:This is another head cracking moment. Food decides mood. Good food makes people happy. We want our guests to feel happy, so we chose a highly well talked about caterer - Neo Garden (http://www.neogarden.com.sg/ ). Again, many said the food was excellent! Phew x 2! Their prices are cheaper compared to Neo's. Their food taste wonderful too! Other than the above, we've no confident to try other caterers. In fact, there are 3 party stores side by side. We bought most party stuff there too! Some treats for the goodie bag was bought there too. Wide range and a one stop place that solves your party woes. Helium latex ballon is at $1 each, and Helium Mylar balloon ranges from $6 onwards. Balloons wise, the above shop (kidzpartystore) offers cheaper prices though. Alright, a long post of research, but hoping it would be of good reference to parents planning a kid's party! Growth is in my everyday. In just almost a year, from birth to date, I've grown so much! There are 2 most wonderful things Mummy appreciates me for - 1. Sleeping through the night and 2. Sleeping on my own. Gone are the days of frustrating midnight feeds and rocking me to sleep in the arms. Just for these, I've made first time parenting so easy for Mummy. 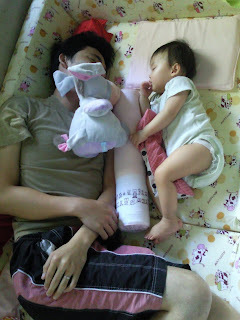 Not so much of Daddy, because it has always been Mum who wakes up for my snacks and rocks me to sleep. Not to minus points from Daddy, but he has been helpful in other areas. There are kids who are still walking up for midnight feeds at the age of 2, this really frightened Mummy. Of course, there are also amazing stories of babies sleeping through after the first month. Although my breakthrough came only in the 8th month, Mummy is really really thankful! As for being able to sleep on my own, it was a gradual discovery. Some months ago, I began to fuss and move a lot when I'm being carried to sleep. Only leaving me on my bed, will I then snooze myself to sleep. Weight catches up with my age, and so this is of great relieve to Mummy's arms. However, at times when I'm not too tired for sleep, I would toss and turn, jabber and jabber until I finally stop moving. That's when Mummy's mission of the day is accomplished! And she is thankful. In everything, give thanks! It makes parenting wonderful when Mummy thank and appreciates me. "Daddy! You're missing out much quality time with me!" That's because he has been sleeping so much. Soccer is the culprit. Haha. This weekend, Mummy has been on duty upon my wake up calls. Even as of now, near noon time, Dad's still in bed! Opps! Weekend mornings are ideal to play with me, when we're all energized from the long night rest. Mummy reads for me, plays with me, feeds me fruits and we play obstacle course. On weekdays, I'm only home as much as Dad and Mum are home. Let's not talk about the morning rush to our individual destinations, it's never quality time made within. In the evenings, when I'm back from school, it's only a good 2 or 3 hours before I end my day in bed. During these hours, it's my meal and bath time, not much play involved with Dad and Mum. One glance at this schedule, we know that our country isn't too family oriented. Can we have shorter work hours please? I need more of Mum and Dad! Mummy thinks it's so important to be there for my every moments, as much as possible . Before you know it, I've outgrown every phase. Sometimes, Mummy does wonder how much difference does it make if we've gotten a helper. Yes, she's contemplating that idea! She foresees laziness, for the salary paid for help, she thinks on most occassions, the child would be left to the helper's care. Mum would then feed me less, bathe me less, not sing me to sleep and even plays lesser with me. Worst scenario, what if a child gets closer to the helper than Mum? It's probably a good choice that we're still coping things well without a helper. It's a trade off or maybe sacrifice, more time with me, less time for their interests. At least, I'm sure Mum wouldn't look back and say, "I should have spent more time with her." So Daddy! It's time to wakie. The weather is so temperamental these days, on some days the aircon is on for me, and some days not. Yesterday, Dad had to work late, so Mum picked me from school. She didn't think of getting a cab as she thought she could handle the walk to and fro school. Along the way, it started to drizzle, then to fat little raindrops. She played with time until the rain subsided a little. Choiceless, school's closing and I've to go, so Mum borrowed an umbrella from the school and we walked home. With me in her arms, together with the added weight of an umbrella and both our bags, the walk was long and 'heavy'. I think I'm getting better with walking. When Mum and Dad came to school for me today, I actually walked to them! Although only a 2 metres walk, I'm pleased with my acheivement. Teachers even told Mum that I can take up to 14 steps, independently. Wow! I'm certified 'green' for school next week. Yipee! Visit to the clinic on a Saturday is as usual crowded, we waited more than 2 hours, just to get an 'OK' note from doctor. That's less than 10 minutes with some expensive fees. Mummy thinks it's not too bad if I can be a pediatrician next time. While waiting for my turn to see the doctor, Mum and Dad brought me for meal at Macdonalds and then shopped around the mall. They didn't anticipate for the wait to be so long, and that is why my porridge wasn't packed out. Mummy panic a while until Macdonalds scrambled egg and pancakes came in just perfect for me. Forgetful Mum didn't bring water for me as well, so Dad got me a packet of apple juice. The achievement of my day is... I managed to drink from the straw, finally! I've tried a few times with straw drinking, but I just didn't know how to. All I knew was to bite and chew on it. Mum tried it again today, and still I couldn't until she presses gently on the packet drink, till the juice oozes into my mouth. This was when I've probably realised straw is for getting fluid into my mouth. I couldn't get my mouth away from straw because apple juice tastes great! Mummy added onto my academic collection again. She bought me 2 Leap Frog DVDs after reading raves about it. One titled, "Letter Factory" and the other "Learn To Read". It sounds too early for these huh? I've no idea what's Mummy expecting of me these days. Well, worry not, I'm sure she's merely getting me engaged and familiarised with alphabets, letter names, sounds and reading, at a brought forward age. She promises fun learning processes during my tender years. Mum wasn't sure how learning and cartoon images is like on "Letter Factory", out of curiosity, she watched it. The storyline is really fantastic! It's like a DVD for the 'regardless of age'. It's so funny to see the little adult in me... Haha! For not being able to go school, Mum is home taking care of me today. It's been such a long time since she re-visit her 'Stay At Home Mum' days. While I'm taking my nap, Mummy searched my photo albums to share some of the candid moments taken recently. This video was taken some time back. It's funny and really made everyone laugh whenever I play with my tongue. Through saliva, nasal discharge, feces, or blister fluid of an infected child. Some sources quoted that it can be spread through air. Not too sure about this though. Is it possible for adults to get it? Yes. Among the infected statistics, one third are adults. Is there any treatment?No. HFMD will just have to run its course, about 5 to 7 days. No medication is given except some oral drops to soothe the ulcers in the mouth. Some mentioned giving salted or cold drinks maybe of help too. Will HFMD re-visit a person who has been infected before?Yes, likely. Unlike chicken pox, HFMD has over 60 strains. There are however 2 common strains in Singapore, Coxsackie virus and Enterovirus 71 (EV71). I can safely conclude that the maximum chances one can get would then be 2 times. I guess these would be the general questions about HFMD. Maybe it's not too bad that I met HFMD early. I haven't got any siblings, so it isn't too troublesome for Mum and Dad, they can limit the spread at home. On a very serious note, it is only responsible that parents take measures to limit the spread to other children, by strictly not bringing your infected child to school, public or crowded places. The only time Mummy brought me out was for a car ride to pack dinner. We avoided children and didn't step out of the car. She even had to reject a couple with an infant who wanted to share the same lift with us. Mummy politely told them to take the next lift because I'm a HFMD carrier. It pains to see me being sick with HFMD, and so it is mother's instinct that we don't want other children to go through it too. So you know, Mummy is getting real bored for staying home with me. Only once the doctor has certified me as 'green', will I then go back to school and hit the malls for shopping! The day is coming... Awaiting. Looks like the spots are clearing. Bingo! I've just met enemy HFMD, and it'll be on me for the next 1 week. It was during lunch when Mummy received a call from school, mentioning that red spots are seen on my palms and feet. First thought was HFMD, being choiceless, Mum and Dad have to bring me away. It's tough for mummy to apply urgent half day, as she just started work. Moreover, she's also taking her birthday leave on monday. Words were hard to bring up, but her boss was nice, she released her. Trying a different PD, they headed to the doctor Auntie Claud recommended, and Mummy's heart sank when Dr Ong confirmed it as HFMD. Doctor was funny, He said, "Ya, kena already." Being first time parents, it really caught Mum and Dad unprepared. Perhaps this is the risk to take for being in an infant care. There wasn't any existing cases and teachers also assured Mummy that toys and place are disinfected everyday. Mystery! Sigh! So this was the reason for my fever last night. No one would have thought I contacted HFMD, I ate and played well last night. What a birthday 'surprise' for Mummy, she had never imagined me meeting enemy HFMD before the age of 1. For having responsible parents, I'm going to be quarantined and stuck to home for a week. No more outings. Sob sob. For now, it's all focus on soothing my discomfort and getting me well. Dear school, teachers, friends and toys, I'll be back once I've fully recovered... I'll miss you! Hmm... for being unwell and stranded at home, Mum is considering new toys to make me happy. Yipee! Mum and Dad saw my hair wet when they came for me at school. They thought I perspired madly, but it didn't look like. Daddy joked that water pipe in school must have burst. All wrong, I was down with a fever again, teacher sponged my head wet to bring down the temperature. Haiz. Fever seemed to have become a monthly affair for me. Mummy's getting really dejected over the series of fever... why does it keep coming back within weeks? Get off fever! This really swayed her mood for birthday celebration, we were all suppose to dine out with uncle ss, auntie sha and auntie mag, when Mummy decided to call off the dinner because she wants to sponge and get me to sleep early. Moreover, there's no enjoyment when we're out with a feverish baby. So, I had dinner, cold shower, milk and then slept at 9pm. Mummy felt a little bad for giving me cold shower, but choiceless, bringing down my temperature was her aim. She was touched that uncle and aunties came over our house to celebrate her birthday instead. This warmed her deeply! For me, I behaved by sleeping well, so that they could have undisturbed fellowship. Thank you all for making Mummy happy. Daddy bought Mum's longed craving Lychee martini cake. Celebration was late, I slept early... so I was excused from the party. Dad received this for his birthday, and now Mum ... let us know if you spotted a baby's Spain jersey. Haha. Mum started worked in a new department, it's almost difficult for her to apply leave to care for me. I hope I'll be well for school tomorrow. Uncle and auntie Les saw my bed last week and they wanted to get one for baby Lucas. In fact, many Mummies like my bed. . The most considerable factor in buying is because it is of floor level. No more worries of me falling off Mum and Dad's bed when I'm asleep. My sleep nest is so spacious that Daddy could nap with me. Daddy was suppose to get me to nap. In the end, he dozed off first. Haha.